Each gm Betamesal Scalp Lotion contains Betamethasone Dipropionate BP equivalent to 0.50 mg of Betamethasone and Salicylic Acid BP 20 mg.
Betamethasone Dipropionate, a synthetic corticosteroid, has anti-inflammatory, antipruritic and vasoconstrictive actions. Topical Salicylic Acid has keratolytic properties as well as bacteriostatic and fungicidal actions. Betamesal Scalp Lotion is indicated for the relief of inflammatory manifestations of psoriasis and seborrhea of the scalp. 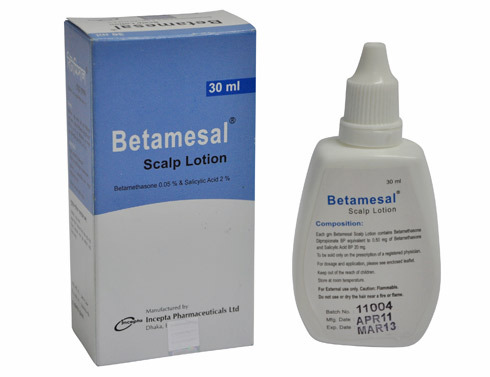 Betamesal scalp Lotion is also indicated for the relief of inflammatory manifestations of non-scalp lesions of psoriasis and other corticosteroid responsive dermatoses. Apply few drops of Betamesal Scalp Lotion to the affected area and massage gently and thoroughly onto the scalp or skin. The usual frequency of application is twice daily, in the morning and at night. Side effects that have been reported with the application of topical corticosteroids include burning, itching, irritation, dryness, folliculitis, hypertrichosis, hypopigmentation, perioral dermatitis, and allergic contact dermatitis. Salicylic Acid preparations may cause dermatitis. If irritation or sensitization develops with the use of Betamesal Scalp Lotion, treatment should be discontinued. Systemic absorption of topical corticosteroids or Salicylic Acid may be increased if extensive body surface areas are treated. Application of Salicylic Acid to open wounds or damaged skin should be avoided. The safety of this medicine during pregnancy and breastfeeding has not been established. However, topical steroid should not be used extensively in pregnancy i.e. in large amount or for prolonged period.